Ceramic Industries’ in-house trendspotters travel the world to identify new décor fashions in order to stay on top of the latest creative innovations. Members of the company’s product development team, Patrizia Cortese and Melissa Brucher, visited Cersaie this year. 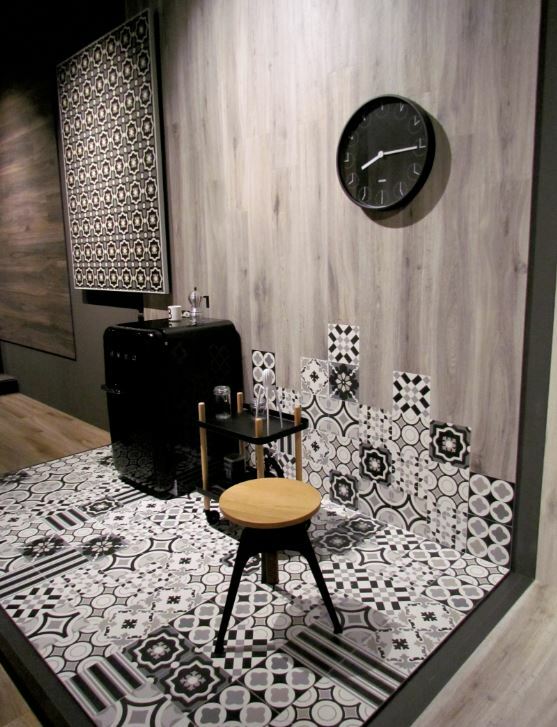 Patrizia, Product and Development Manager for Ceramic Industries in South Africa, said the exhibition gave them the opportunity to see the latest European trends at Cersaie, the most important exhibition for tiles in the world. Melissa, Product Development Co-ordinator for Ceramic Industries, commented: “We saw some very interesting combinations of textures and materials. For instance, matt and glossy tiles laid side-by-side on floors and walls, or cementine patchwork tiles with strong graphic patterns laid alongside wood,” said Melissa. While tropical foliage and watercolour florals are still popular, some of the new colours popping up in the design scene include antique pink, teal and the powder-blue of ‘carta da zucchero’. Greys still predominated in many of the exhibitions, although there seemed to be a move towards darker charcoal tones. Earth tones like pastel avocado, brown and beige in matt finishes had a showing in bathroom wear, while matt gold and rose gold replaced copper as fashionable choices for accents in taps and accessories. Many of the same styles that have been popular in South Africa, including wood and marble replicas, have been taken to new levels of refinement, noted the trendspotters. They also observed that the same kind of sophistication and detail are being produced locally at Ceramic Industries, and in the larger formats that have been so popular in Europe. Melissa and Patrizia felt the company’s constant investment in production and printing equipment allowed them to match the best they saw at Cersaie. Regarding personal favourites and stand-out pieces at Cersaie, Patrizia liked the 3D wall tile that resembled woven threads, while Melissa was impressed with the use of ceramics in furniture, like the bench constructed using one long, continuous length of curving ceramic. Whatever their individual tastes, the team agreed that South Africa’s own Ceramic Industries group can compete with the finest in Europe. “I’m very pleased to see that the work our studio in South Africa is producing is every bit as creative and on-trend as the best in the world,” added Melissa. For more information contact Ceramic Industries on Tel: +27 (16) 930 3600 or via www.ceramic.co.za.